Railpictures.ca - Steve Bradley Photo: In 1981, there was still plenty of branchline character along the CP Princeton Sub. The Princeton wayfreight is arriving at Princeton with just a van behind still high nosed GP9 8617. The train order board is a study in simplicity, and the station is about as basic as they got. Unfortunately, a few short years later, it would all be gone. | Railpictures.ca – Canadian Railway Photography – photographie ferroviaire Canadienne. Caption: In 1981, there was still plenty of branchline character along the CP Princeton Sub. 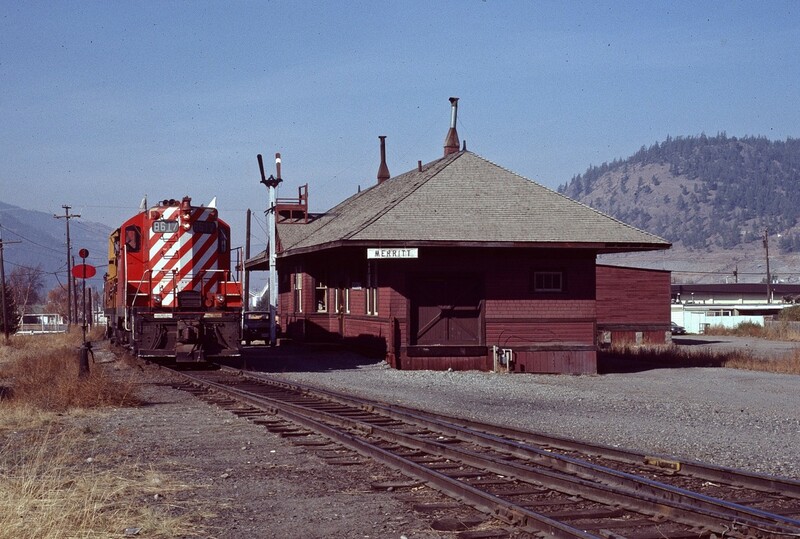 The Princeton wayfreight is arriving at Merritt with just a van behind still high nosed GP9 8617. The train order board is a study in simplicity, and the station is about as basic as they got. Unfortunately, a few short years later, it would all be gone. was also a rare find back then. Perfect scene. Pity such a nice old building would be deemed expendable. It is a classic.